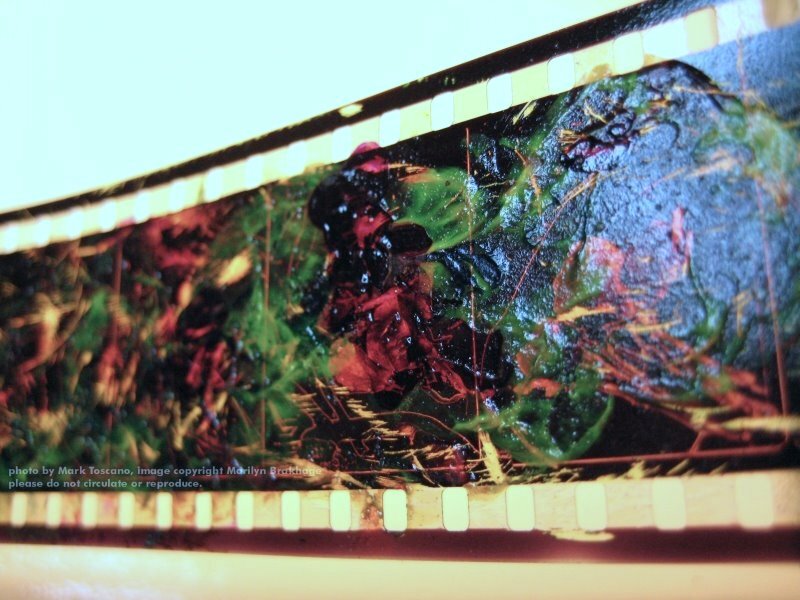 Several months ago, I went through pretty much all of Stan Brakhage’s 35mm painted originals to figure out what was up with them regarding their condition, production process, and what they might need in terms of preservation. Now, maybe this is something some people have already noticed, but personally I was surprised to discover that Stan created Hell Spit Flexion (1983) by painting over a 35mm print of The Garden of Earthly Delights (1981). The photo here is of the painted original, and you can see this magenta faded print of Garden… underneath the paint, particularly in the lower center (as it’s oriented in this photo) of the middle frame. The color in the underlying print of Garden… is faded because, as many of you probably know, Eastman Kodak’s color print stock (in particular) had major dye stability problems up to about 1982, when it was reformulated to “low-fade” LPP stock following a major outcry and ultimatum from dozens of filmmaking luminaries (one of whom was Stan Brakhage). So there is already a 35mm internegative of the film, made in 1983 from this painted original, which could sensibly be considered an “original negative” of sorts. However, if we decided to go back to this painted original to make a new preservation negative, the faded color of the underlying Garden… print would make it very difficult (or perhaps impossible) to match the original appearance of the film at the time of its making. That’s all for now… as I said in the previous post, let me know if you think the watermarking thing is OK, or annoying, or ineffectual, or whatever. Thanks! This is great. This is my first time on this blog. I clicked on the link you posted on Frameworks, and this is fascinating stuff.I use to intern at the Film Coop, and I can’t tell you how much I enjoyed the inspection/cleaning of the handpainted Brakhage prints. It’s an amazing insight to his process.Keep up the good work. Hi Myron – I think Stan was very aware of the framelines in 35mm. On the original for The Garden of Earthly Delights, for instance, he had marked off all the framelines with a marker at the edges of the film to serve as a guide. I get the impression he was very conscious of that.As for Hell Spit Flexion, I think the more interesting thing for me is that the newly painted imagery would work as a separate layer from the existing moving imagery underneath, creating two planes of motion. He has a few films that work with this approach. <>I’m positive that hands-on relationship had an impact on the way that I think about film, and the way I approach films I’m making too<>Same here. I’ve found that films I work on come out better if I’m cutting them on a set of rewinds and moving them to a projector, than just cutting them on a Steenbeck. I’ve got to chalk that up to looking at so many great films on rewinds. Robert Beavers works the same way, and his films are beautifully cut. I was really amazed to see Chick Strand’s workprints – they’re THRASHED. Like she must’ve gone through them over and over, cutting and recutting, though perhaps on a flatbed, I’m not sure. And I think her films are exquisitely cut.